I rounded a corner and discovered this beauty on a coat rack of a couple other older vintage items amongst a myriad of 80s shirts, and it has been a definite evolution of relationship between us. At first I looked at the fabric and thought "1960s" when I saw the bright colors out of the corner of my eye..... but then the feel of the fabric and shape of the garment definitely suggests rayon and a 1940s silhouette. But the color combo is eggplant and teal with almost neon fuschia and lime shapes, a pairing that seemed unusual to me for the 1940s. The matching bolero, too, seemed like it might be reminiscent of the late 40s or early 50s, but the rest of the dress, again, seemed possibly earlier. Research had to be done. Anyone else had love for a clothing item come softly, evolving from apathy or even dislike to completely adored? Such was the case here. Lesson learned: Try things on before judging them completely. Now that I had determined the dress was fantastic, I did want to find out more about it, especially the fabric. After closer inspection, I realized it's an India-themed novelty print, complete with elephants and musicians! 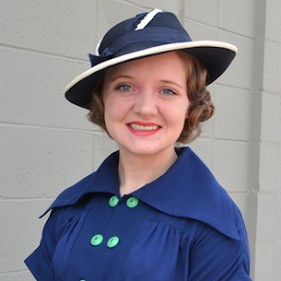 This bolero looks exactly like the one coordinating with the dress, except mine has front pleats instead of darts. So, even though I couldn't find exact dates from these patterns (I tried, trust me, very difficult), the styling of the illustrations does indicate the 1940s. Mystery solved! The fabric does still baffle me because I really can't find anything even remotely similar to it. 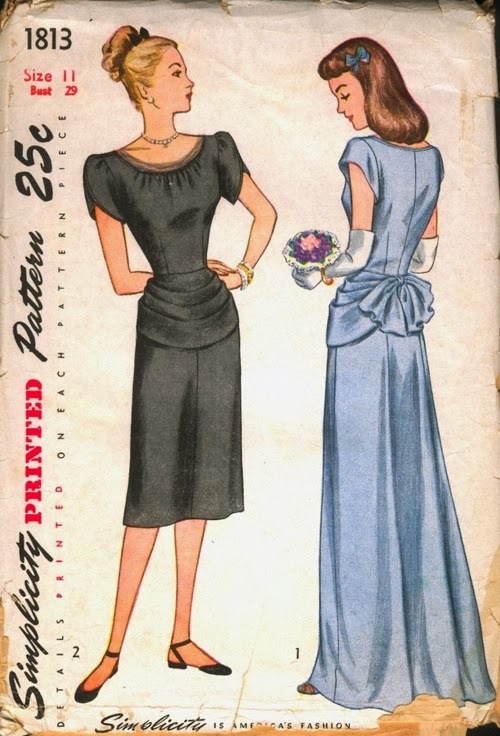 The jury is still out on the fabric, but I think the construction, fit, and silhouette definitely point to the 1940s. Any of you have any guesses as to whether it's an early, mid, or late 1940s garment? I really can't decide. Is the dress handmade? If so, maybe someone used a vintage pattern? It is an amazing fit for you and looks very elegant. The color eggplant is so lovely. You know what I also like is the vibrancy of the outfit. Love that you brought out your chair:) I've been on the hunt for a local vintage chair as I don't want to pay shipping costs. Wonderful post. If I had to guess I'd say early 40s. I wouldn't go with later 40s as the big shoulders were in. The amazing thing is that there is no fade to your lovely dress. Great pick up. I do think the dress is handmade because the point at the back isn't exactly right (although still lovely), but I think it was probably still made in the 40s. The fabric feels like rayon or, you know, "40s-ish" fabric (both the purple and the print). It also has a large metal zipper and a hand-done blind hem. I researched prints too, and I was actually surprised to find some novelty prints from the 40s that were really bright in color scheme like this one, although I couldn't find a pattern similar to this one. It could definitely be made later with an older pattern, but I guess there's not much way to find out for sure! That would definitely explain the mod color scheme, though! And I was thinking early 1940s, too, but I couldn't quite put my finger on it. Knowing you think so, too, makes me feel way more confident in it! Thanks for your input! It's such a mystery; I just can't feel certain either way! So many conflicting clues! You really pull that dress off! I love it! And your hair looks fantastic, btw. Such soft, perfect curls! Aw, thank you so much, Gillian! And as for the curls, they were a bit wind-battered by the time I got to this photo shoot, but a good brush-out will do wonders! 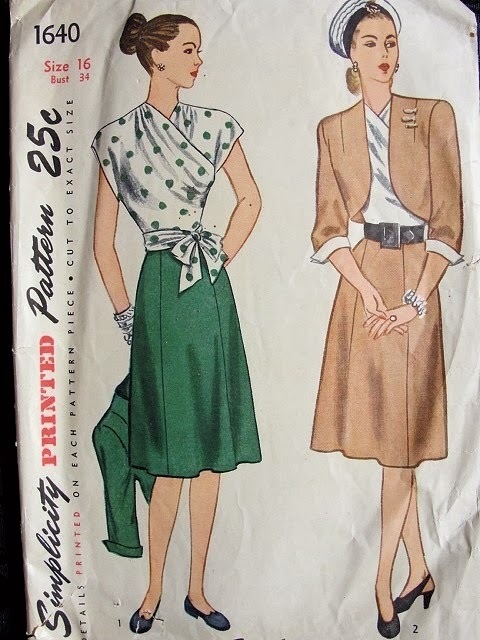 That sort of draping was popular in '46 and '47 right at the end of the war before the new look popped in. You know looking at the dress some more I actually do see this too. 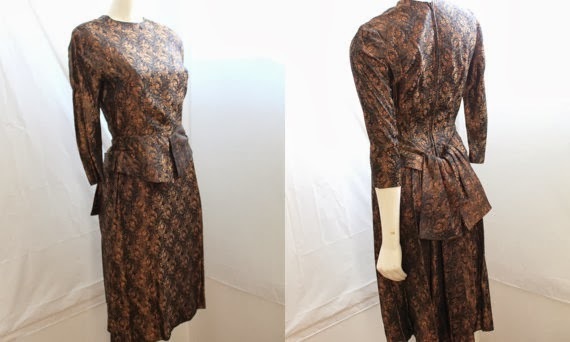 It is quite a lovely dress and a very lucky find! What a marvelous find! 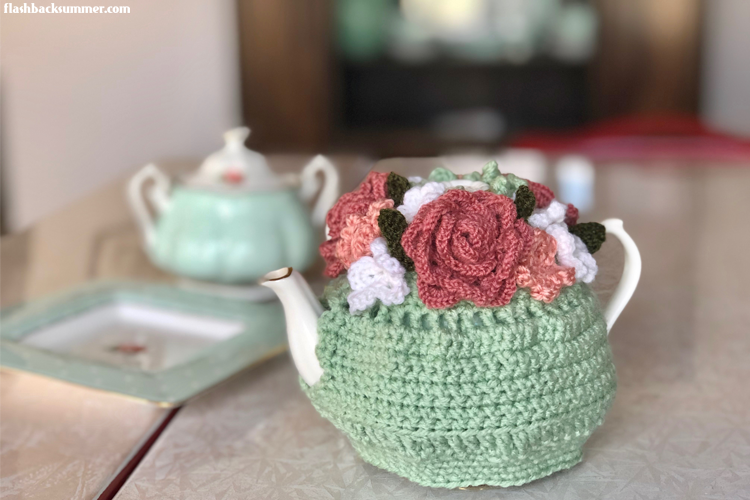 That pattern is so lovely, unique and special! I second what others have said above about that style of draping being in widespread use immediately after the war (though one can find earlier and later examples of it). What is less common for the era is a collar that pointed, but I don't think that means it can't be from the 40s, of course. Its presence just adds to the allure and sense of stylish wonder to this terrific frock. The collar threw me off as well. Of course, pointed collars were popular in the 40s, but you're right, not usually THAT pointed! I couldn't find any similar photos, patterns or garments with a collar like it. Such a strange garment! Great find. It is an odd print but after looking at all your pictures it's kind of growing on me. :) I completely agree with you that some vintage pieces need a second, or third look! My thought as far as date would be late 40s as well. Yep, the print had to grow on me, too! The fabric (along with the rest of the garment!) is just so intriguingly confusing with all its mixed styles, but I'm leaning toward that right-after-the-war period as well, thanks to all the comments you guys have given! The print is amazing especially when you showed it close up. What a great shape as well! I think this is one of my favorites that you've ever shown. I'm basically DYING! This dress is too amazing for words!!! Guh! And, yes! Do try things on before judging! I've gone through that many times, including my own wedding gown!!! Ha, thanks, Janey! And dang,I bet you're eternally glad you tried your wedding dress on! That's awesome! I've definitely learned my lesson, too, though this dress is not quite as important. Love the dress and those shoes really make it pop! It definitely could be! Everything except the color seems to point to the 40s, but the collar (and now that I think of it, the accent fabric) could be 70s. Such a mystery! 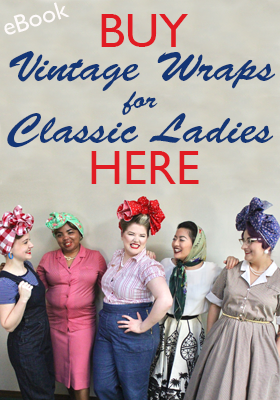 Sew For Victory 2014: My Projects! Spring Break and Amazing Finds Update!